The aim of the ‘alliance of the ancient clans of the Kingdom of Desmond’ is to foster awareness of, and respect for, what is a most eminent part of Gaelic-Irish history. Its purpose thus is to act as a cultural ‘trusteeship’ for the history of Desmond*, and to be a voice for the now titular inheritances of all the families / clans with roots in this ancient Irish kingdom. The interest and participation from all Irish families of non-Gaelic origin (e.g. Vikings, Normans, etc) who also have had historic relationships to the Desmond area is of course very welcome, as these families are also considered to be ancient clans of the Kingdom of Desmond. * Desmond; from the Irish-Gaelic Deas-Mhumhain – which means South Munster. 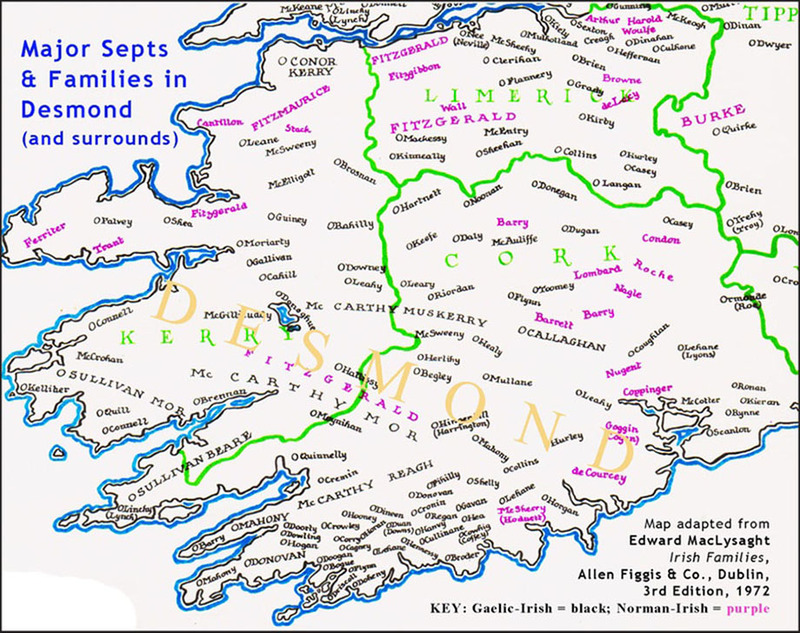 Participating clans / septs, who wish to be “cultural custodians” for this part of Ireland, are committed to perpetuating the history and heritage of the many families / clans within that area of south-west Ireland what once was the Kingdom of Desmond. (The Irish Kingdom of Desmond existed under the MacCarthy Mórs, the Kings of Desmond, until the Old Gaelic Order was fully overthrown by the English colonizers, following the catastrophic 1601 – 1602 siege and battle at Kinsale.) We acknowledge there must still be descendants of the old Chiefly-bloodlines among various Desmond clans / septs; being those clans that have remained chiefless since the end of the Old Gaelic Order. It is hoped this lamentable situation may possibly be addressed in the future, by means of Desmond clans / septs working cooperatively, and with the help of qualified genealogists. This alliance of clans is committed to research and educational exchange, and to providing an informal medium for communication among descendants of the various clans / septs of the ancient Kingdom of Desmond.